While I've bee n running around like a crazy person, the 2009 Winter Blog Blast Tour has been going on! Don't miss it! Check out interviews with some of your favorites authors including (but not limited to) Mary E. Pearson, Megan Whalen Turner, Patrick Carman, and Laini Taylor. And OMG November is almost over and I still haven't posted a link to Liz's roundup of web resources to celebrate American Indian Heritage Month. Sorry, I fail. That great roundup does not fail. If you've got a hankerin' for a good book discussion, consider joining Michelle of GalleySmith for her Literary League Book Club. They've got some great books lined up for the next few months . Jennie's blog is turning FIVE and she is throwing a big party over at Biblio File! Who doesn't love a big party, right? In case anyone's started thinking about holiday shopping already, MotherReader's got a collection of Amazon bargains. Chicken Spaghetti's got an incredible list of Best-of-2009 lists and Shelftalker has a comprehensive list of starred titles (thanks to Travis for both links). For that extra-special gift, consider supporting independent bookstores by purchasing a signed and personalized book through Books with Flair (link via Blue Rose Girls). Books with Flair pairs authors with indie bookstores to provide signed books for gifts this holiday season. /shameless plug. Where was I? If you've ever wondered why series books sometimes tend to expand in length exponentially as the series goes on, well, Editorial Anonymous can shed some light. If you're one of the mad hoards who headed out at midnight to see New Moon, you might be interested in John Green's defense of liking Twilight. Amen, brotha. And speaking of Twilight, Anna shares her plans for an after-hours New Moon party over at Y Shush? 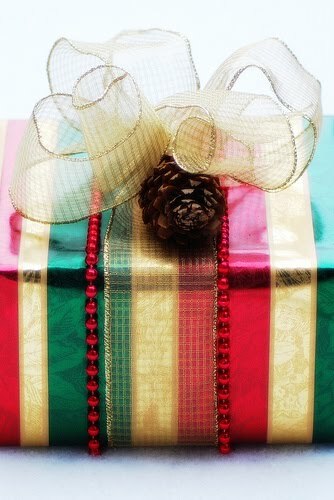 Image credits: top image = In Lights by Alyson Hurt, 2004, accessed from everystockphoto.com, image of gift by Flickr user mysza831 used under Creative Commons license. I feel perpetually behind right now! My feed reader is painfully full, my posting habits have slowed and I've got so many books to write reviews of I don't even know where to start, haha. I hope you take the opportunity to join the Literary League discussions (if book you'd like to read pops up on the list)!